ENGELS, December 9. /TASS/. Russian Helicopters holding won the tender on supply of spare parts for Mi-8/17 helicopters of Peru’s Air Force and will start deliveries next year, Executive Director of the company Grigoriy Kozlov said on Friday. “The holding won the next tender on supply of spares for Mi-8/17 helicopters of Peruvian Air Force. Peru will start receiving spare parts directly from the helicopters manufacturer already in the beginning of 2017 after making relevant contracts,” Kozlov said. This will promote combating counterfeit components posing threat to helicopter flight safety and life of crewmembers, he added. The Russian helicopters manufacturer also plans to build a pilot training center in Peru next year, Kozlov said. “The intention of the holding to build and outfit a helicopter simulation center for the Peruvian Army evidences importance of the Peruvian market for Russian Helicopters. Construction of the simulation center near Lima will start recently. Representatives of the holding plan to complete construction already in 2017,” the senior manager said. 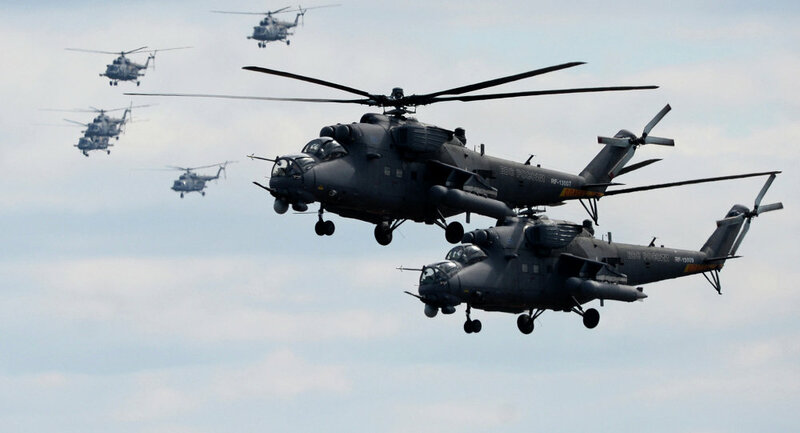 Creation of such a center in Peru will significantly reduce training time because Peru’s pilots of Russian Mi-171Sh helicopters will train in the territory of the country, Kozlov added. Kabul intends to strike a deal on buying Mi-17 and Mi-35 helicopters from Russia. KABUL Afghan National Security Adviser Hanif Atmar is planning to agree on the purchase of Russian helicopters for the country’s Air Force during his upcoming Moscow visit, the press service said Sunday. “One of the major aims of the visit is to purchase Mi-17 and Mi-35 helicopters for Afghan Air Force,” the press service said in a statement, adding that Kabul is expected to negotiate maintenance and repair as well. During the visit, which is set to kick off on July 25, Atmar is expected to meet with Russian Security Council Secretary Nikolai Patrushev. Broader political and security cooperation, as well as bilateral anti-terror and anti-drug strategies are likely to be on agenda of the talks as well, the statement said. India and Russia have begun negotiations on a contract to deliver 48 additional Mi-17V-5 helicopters, the Indian ambassador to Moscow, Pankaj Saran, said. On February 2, the aircraft manufacturer, Russian Helicopters, delivered the final batch of 151 Mi-17V-5 helicopters to India under previously concluded contracts. “The process has started to purchase additional units of such helicopters and contracts are expected to be signed on conclusion of the due process,” he told RIA Novosti. The ambassador added that he does not see any major problems in reaching the agreement on the deal. Last week, Russian Helicopters said it planned to sign a contract with India for the delivery of an additional batch of 48 Mi-17V-5 helicopters before the end of 2016. The Mi-17V-5 helicopter is the latest model in Russia’s Mi-8/17 helicopter family. Designed for personnel transport, as well as for carrying cargo internally or on an external sling, it is used in search and rescue operations, and can be equipped with weapons. SINGAPORE, February 18. /TASS/. Thailand may order this year an additional batch of Russia’s Mi-17V-5 (NATO reporting name “Hip”) helicopters, a source in the Russian military-technical cooperation sector told reporters on Thursday. “Thailand has previously bought six Mi-17V-5 helicopters manufactured by the Kazan Helicopter Plant. We hope it will buy another batch. The negotiations are conducted through Rosoboronexport (Russia’s state-owed arms exporting company). We hope that the negotiations will bear fruit as early as this year,” the source said. The helicopter is one of the most advanced modifications of the Mi-17 family. It is produced by JSC Kazan Helicopters and sold through Rosoboronexport. Indonesia bought its first Mi-17V-5s under a 2008 contract. This was the first time that the Thai military preferred a Russian aircraft to a US-made. With the delivery of a final batch of Mi-17V-5 helicopters to India, Russian Helicopters has completed a contract to supply 151 such aircraft to the Indian Air Force and other Indian government wings. The Russian Helicopters Holding (a Rostec company) has delivered the final batch of Mi-17V-5 military transport helicopters to India, completing the major contract to supply 151 aircraft, a company statement said Tuesday. Rosoboronexport signed a contract with India in 2008 for delivery of 80 Mi-17V-5 helicopters and related equipment, which was completed between 2011 and 2013. During that period, additional agreements were signed to supply Mi-17V-5 aircraft for the Indian Air Force, Ministry of Internal Affairs and the President’s Secretariat; a total of 71 vehicles. “The holding has transferred the final batch of helicopters to the Indian side under a previously signed contract. From Rosoboronexport, India has received 151 Mi-17V-5 military transport helicopters, produced by the Kazan Helicopter Plant (KHP),” said the press release. “India is a key market for Russian Helicopters, and the largest operator of Russian helicopters in Southeast Asia. Today, more than 400 vehicles are operating in the country, and they have proven their worth. 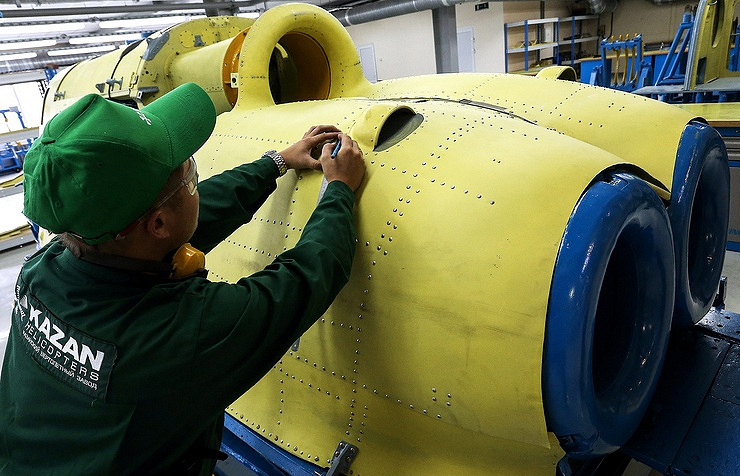 We manufacture high-tech multi-purpose helicopters, which are able to solve challenges anywhere in the world,” said Alexander Mikheyev, general director of Russian Helicopters. The Mi-17V-5 helicopters that were supplied to India, are among the most technically advanced helicopters in the Mi-8/17 family, making use of the best engineering discoveries of previous generations, said the press service. Each Indian Mi-17V-5 helicopter is equipped with a KNEI-8 navigation and electronic display complex. In this system, numerous indicators from a number of helicopter information systems have been replaced by just four multifunctional indicators, which has made the dashboard smaller and simplified the work of the crew. This system also speeds up pre-flight checks of the helicopter, because information from all sensors is displayed on the monitor screen. The helicopters supplied to India are equipped with modern, powerful engines, which significantly expands the possibility for the transport of heavy and bulky cargoes, especially in the conditions of the Indian highlands.